1.) 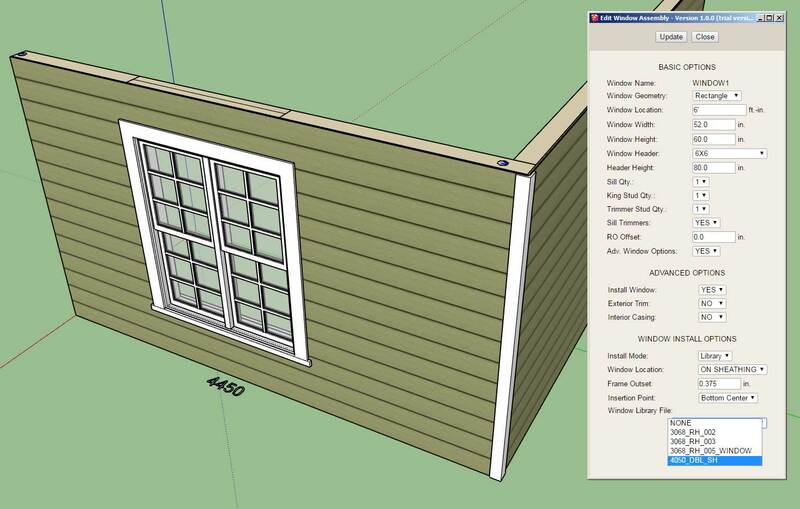 Window Location: ON SHEATHING or ON FRAMING, this parameter will offset the location of the window within the wall by the sheathing thickness automatically or place it inline with the wall framing. 2.) The window location within the wall can be further modified/customized by adjusting the outset with either a positive or negative value. Since this particular library file already has the proper trim and casing as part of the component I have turned off these advanced features for this opening. If it did not I could alternatively enable both the trim and/or casing within the plugin even though the plugin is not actually drawing the window itself (it is bringing in a third party component instead). The plugin will automatically populate the library dropdown with any valid SketchUp files found within the sub-folder "library/windows/". I am now working on the door modules to extend this functionality for doors. I am also interested in working with other plugin authors so that I can establish an API which will allow the wall plugin to talk to their window/door plugin and automatically pass parameters back and forth so that opening location and size can properly sync with a third party plugin. You might also notice that there are two dots shown on the top plate at each end of the wall in this model. This gives the user indication that holdowns are installed in this wall panel at these locations. In 2D mode these indicators will also be shown even though no hardware is drawn. 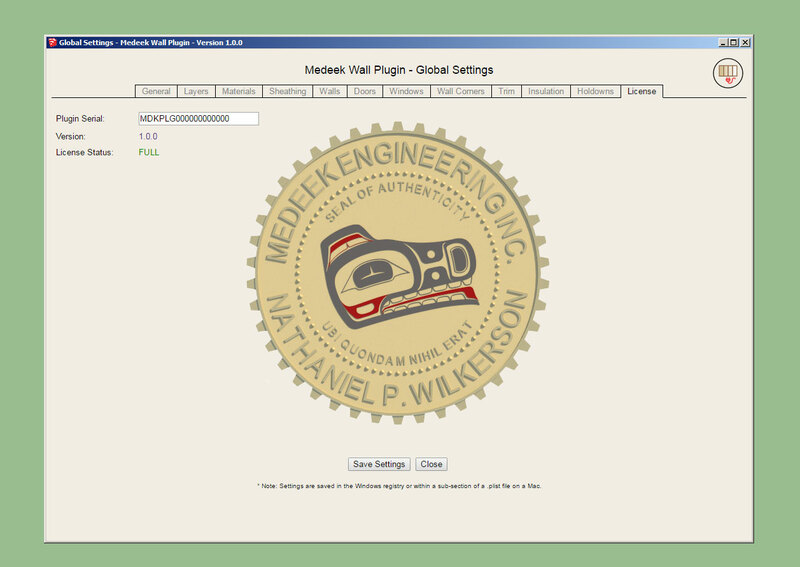 Working on updating the global settings to reflect the myriad of settings added to the plugin in the last month. 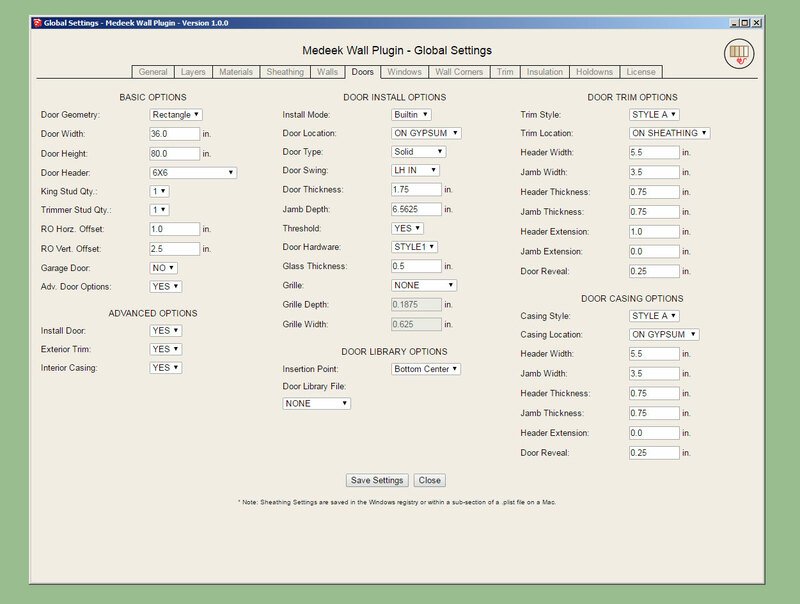 The window and door tabs will have the largest amount of options. Updating all of these html pages is rather tedious work but it is necessary. There are probably a few more additions that can be made to some of the tabs but I think we are good enough now for the initial release. Updating of the interior wall algorithm so that it properly detects "Tee" intersections. I also need to update the door casing for interior walls and add the gypsum wrap for interior walls with framed openings that do not have a window or door installed (ie. plain opening), however these are minor items and can probably be attended to after the initial release. I have some known issues with the "no frame" option that need to be addressed but should only require a few minutes to remedy. I will start working on the "Tee" intersection algorithm tonight and hopefully wrap this up tomorrow. Please do not use the plugin in its current state for any production work. I am afraid that you may loose data given the potential for bug splats and other issues with the plugin being so newly minted. Please keep your ruby console open while using the plugin and feel free to cut and paste any issues to me via email. As much explanation regarding any errors would also be helpful. To be honest I don't feel like I've tested the plugin out nearly enough especially while using metric templates however the pressure to release the plugin now, rather than later was quite overwhelming. Tomorrow I will begin addressing bugs and also I will begin work on the new todo list. Had an interesting request for Simpson Strong-Walls to be added to the plugin this morning. I may entertain this possibility seeing as it probably would not be too hard to add this functionality. The addition of elements within the wall other than windows and doors actually is something I've been meaning to give some additional consideration to. Right off the top the two items I can think of that are similar to windows and doors (at least logistically or from a coding standpoint) are "in wall" columns and posts and specialized panels such as Simpson wood or steel strong-walls or Simpson Moment Frames. In fact, all of these can be essentially treated as door like openings with their own special set of parameters so the wall geometry creation algorithms are already in place to add these elements in. What other "in wall" elements am I missing here? In the situation shown above I probably would have carried the king studs next to the column all the way to the bottom plate but I think the idea his clear. Some inwall columns are the full height of the wall with the beam resting the on the top plates and some are similar to the situation shown, both must be made available. Column Height: Measured from base of wall (default would be FULL which would make it the same height as the studs in the wall. A height less than the wall height would create a beam pocket arrangement with two king studs next to the column. Beam Pocket King Studs: This option only applies in the situation where there is a beam pocket, NONE, 1, 2, 3. Vertical Offset (Bottom): Allow the column to project below the bottom plate so that it can bear more directly on foundation below, see window wall below. Default value would be zero which would frame it flush with the bottom of the rest of the wall studs. Here is a window wall I detailed out a couple of year ago, notice the PSL column running the full height of the wall. One could argue they are not columns but actually the king studs next to the windows, I agree that is a bit of a grey area. 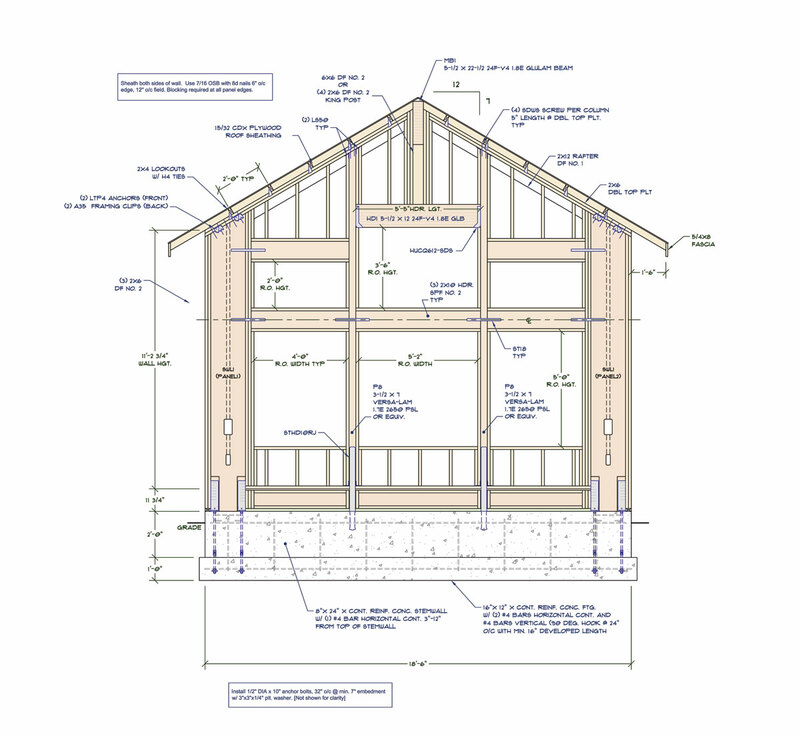 Also notice the use of the Simpson Wood Strong-Walls, cut to suite for the raked wall and the beam pocket for the central glulam beam that bear on the window header. Note that this detail is not complete since a number of callouts are missing, probably a screen shot about halfway through the detailing. It would be nice if the wall plugin were capable of handling a window wall such as this, with stacked windows, columns, beam pockets (that can interact with windows and doors below) and Simpson Strong-Walls. - Fixed a bug which limited window height to only 48 inches. 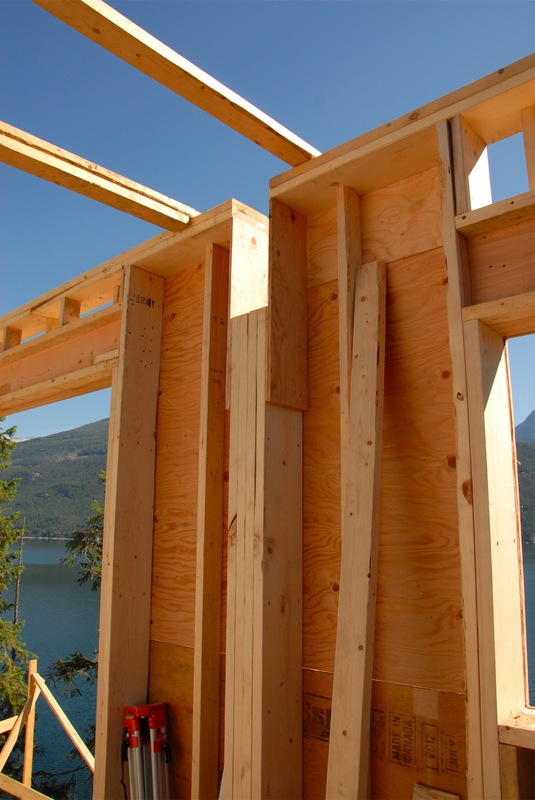 With the Strong-Walls the plan is to offer both the steel and the wood varieties. 1.) Please click on the global settings, visit each tab, familiarize yourself with the various options, turn on layers, materials etc... I have had a number of questions about why the plugin does not keep the materials assigned to it. 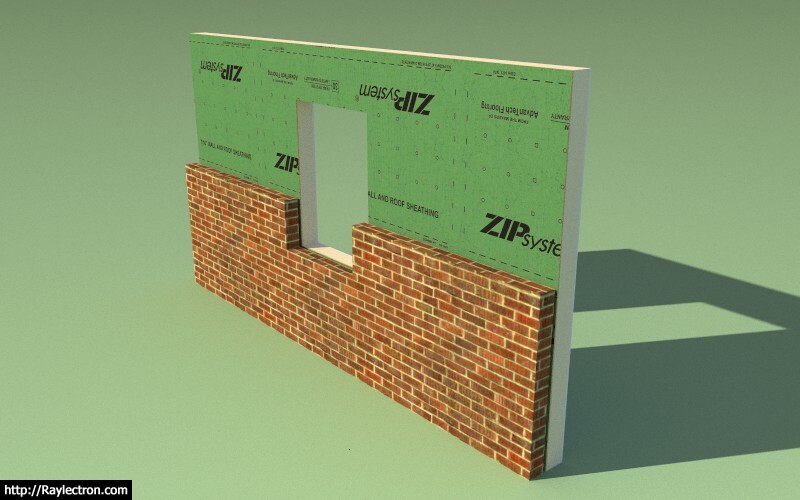 Realize that any manual edits to the wall assembly (group) will be eliminated once you make any modifications to the wall with the plugin, it has to rebuild the entire assembly from scratch in order to capture any changes made to it, otherwise it cannot be fully parametric and editable. The downside to being fully parametric is that the plugin has full control of the assembly. If you need manual edits to live with a wall then you have to place that geometry outside of the wall assembly group, if you place them inside they will be erased on a rebuild. There may be some workaround for this in the future but I haven't quite got that far yet. Each wall assembly (group) has a fairly extensive library of attributes that are essentially a database for the wall panel. Every aspect of the wall assembly is defined by a parameter in this database. The wall panel can be rebuilt from scratch just from this dataset. The 3D model generated by the plugin is simply a geometric manifestation of the dataset stored in the attribute library. 2.) If you have a specific bug to report, please if possible, include any error codes generated within the ruby console. Without these codes I am running blind and merely guessing in some cases. Some of the issues I've seen today I am unable to duplicate on my machine so I can't fully address them. The error codes are critical to my debugging process and ultimately correcting any issues that may exist. Of course this may not apply to functional types issues involving UI behavior or specific feature requests, I do recognize that. - Fixed a bug with the wall polyline tool so that the wall line will snap to the X or Y axis. 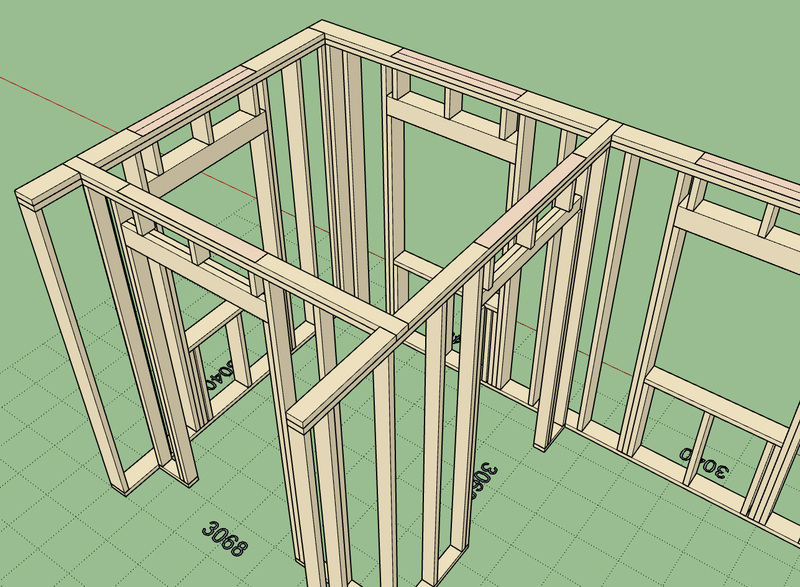 - Added ZIP Systems(c) 7/16" and 1/2" wall sheathing materials to the sheathing tab of the global settings. - Added the Z Height option to the wall creation tools. The Z height parameter and option to enable this feature are found in the walls tab of the global settings. - Created icons and added toolbars for the Simpson Strong-Wall module and the Columns module, both of which are still under construction. Just when I think I'm starting to figure this thing out it gets a little more complicated. Typically we see stone or brick with a siding or stucco product above it. So instead of a single type of cladding and cladding thickness on the wall we might have two different types on the same wall panel. Any thoughts on this type of construction, preferences or further complicating factors? I think I basically need to allow for more complicated cladding scenarios. Notice the stucco trim just above the wainscoting and then the ledge of stone that projects beyond the wainscoting just below it. 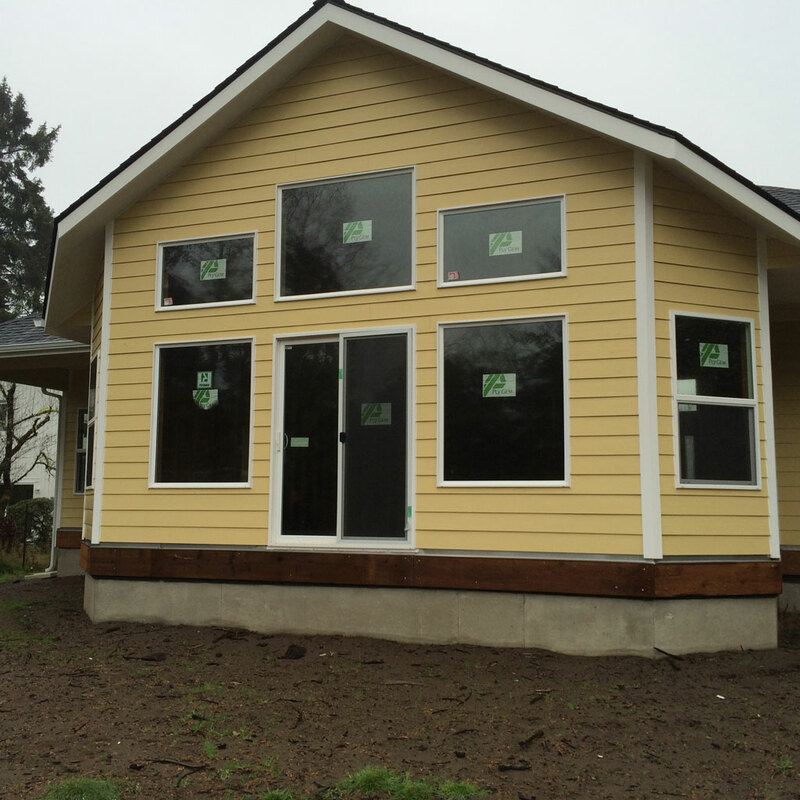 Also notice how the stucco trim around the window and doors meets the wainscoting trim and terminates there. Why can't you designers and architects keep things simple, I'm going to have to jump through some hoops to code all of this. I've already rolled out two revisions since the initial beta release. Please download, uninstall the older version of the plugin and then install the most current version. I've seen some issues with corrupt installations where a newer version is installed on an older version. You need to uninstall the plugin first before upgrading, that is the safe bet. I am still noticing a lot of people sending in comments that they are unable to get materials applied when they have not enabled the auto material assignment in the materials tab of the global settings. I think what I am going to do is have the plugin set this particular setting to "ON" as the initial default behavior rather than "OFF". I will make this change live with the next release. When a wall gets rebuilt (ie. edited, moved, opening added, or switched between modes) the tee intersection algorithm is run and any intersecting walls will be detected (any walls that are touching the wall in question and have a "tee corner" configuration at that end). What this means is that if you manually move an intersecting wall and slide it along the main wall and then rebuild the main wall the top plate will automatically update with the correct cut out as shown above.